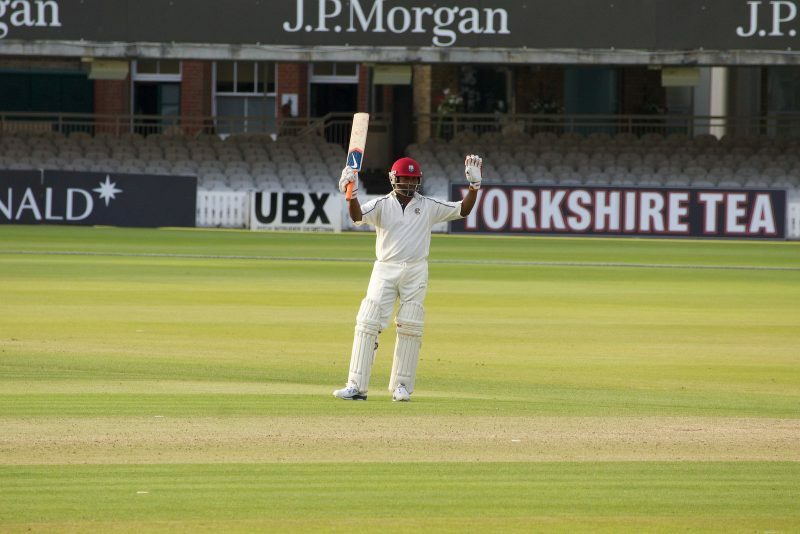 Brian Lara at the Lord's Bicentenary Anniversary Match, June 22, 2014. Photo by Paul Hudson, CC BY 2.0. In international cricketing circles, Brian Lara  is a rock star. Deemed one of the greatest batsmen of all time, he is practically like royalty in Trinidad and Tobago, the land of his birth. But his name (and the fact that he lent it to the country's new stadium  in south Trinidad) has been something of a political football ever since the controversial stadium  — the construction of which was mired in allegations of corruption and financial mismanagement by previous governments — was finally opened  under the People's National Movement (PNM)  administration . Mount Hope  is a public hospital that has had its share of controversy ; the country's public health system often falls short of the demands made on it. Opposition senator  Khadijah Ameen also pushed the stadium versus health care angle of the narrative, quoting from a newspaper report  about protests regarding the government's decision to open the stadium while the nearby children's hospital , built under her party's tenure, remained closed. While members of the country's opposition party (and other politically aligned Facebook groups) downplayed  the numbers in attendance at the stadium's opening, several Facebook users posted  photographic evidence  that the stands were full . 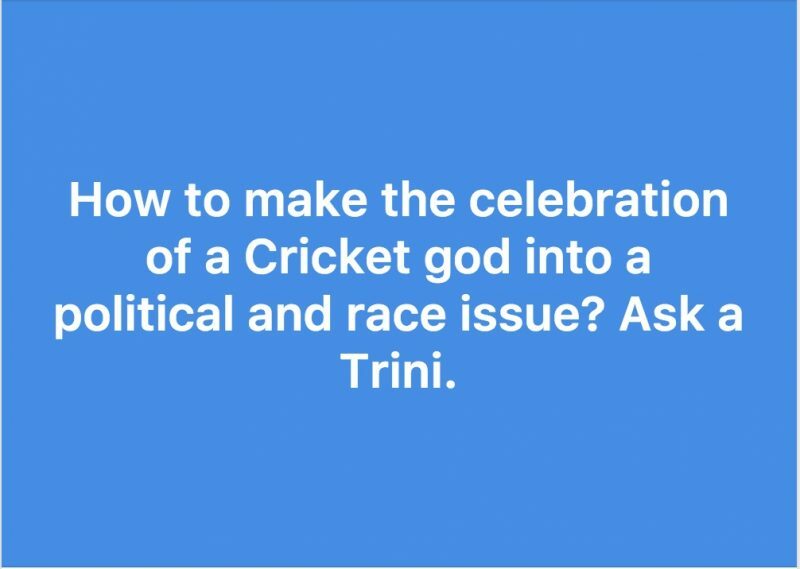 Upon reading similar comments, Facebook user Colin Chalmers suggested , tongue firmly in cheek, that “maybe the first match at the Stadium should have been Indians vs Africans.” Trinidad and Tobago is, for the most part, politically divided  along ethnic lines, with the opposition United National Congress ‘ (UNC) support base being primarily Indian and the PNM's being largely black. Lara and his sporting accomplishments always seemed to transcend race, however — until the stadium came into play. Imagine. the PP [coalition People's Partnership government, of which the UNC was a part] had completed the BLCA [Brian Lara Cricket Academy] and is today opening it. now imagine Brian Lara walking onto the field to greet Kamla [former prime minister]. now, Imagine what the PNM party hacks would have said about Lara. As I recall the story. 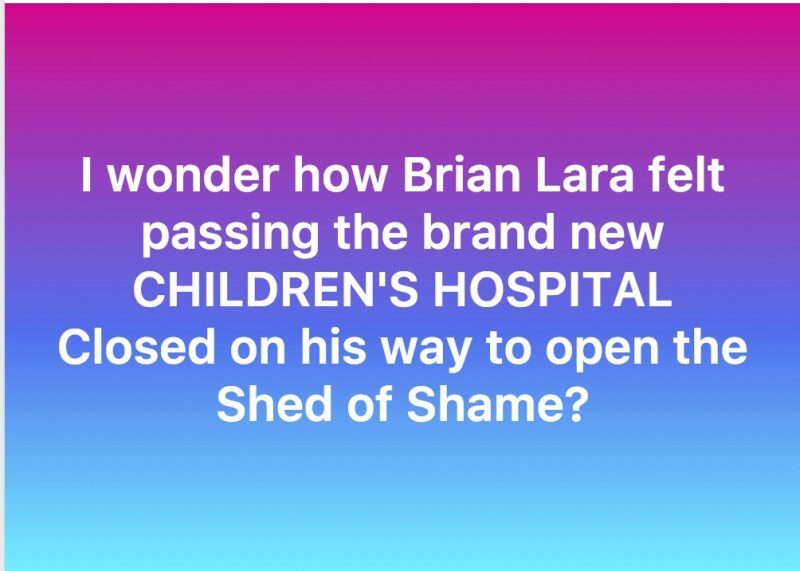 One day Patrick Manning [former prime minister and leader of the PNM] asked Brian Lara how could Trinidad and Tobago get a 1000 Brian Laras. Brian explained to him that he was just fortunate to have the Cricket talent that he has. But most importantly, he told Mr Manning that all over the world where he had played cricket, some countries have a cricket Academy where they teach young potential players the rudimentaries of the game of cricket. Young players will live in the Brian Lara Academy where they will train, lift weights, be trained in proper dieting, have the benefit of psychologists, have their bowling and batting actions filmed, analyzed, and improvements in techniques will be worked on. Sports is not a hit and miss guessing game again. Sports is big business. So here is my question to you Mr and Mrs UNC Naysayer. In 2020, your young son has been observed and chosen as a candidate to enter the Brian Lara Cricket Academy. Scouts from all around the world done start comparing the little boy from Barrackpore as the next Lara. Cricket is his passion and he is a boss student at Naparima. Would you allow him to attend the Brian Lara Cricket Academy? Brian Lara I just want you to know that it's not YOUR money that built that stadium. It is the people's money. So next time when you are referring to the stadium, please don't say ‘ MY stadium’. Say OUR stadium. Ok? You don't have to start sounding like the PNM now just because they name it after you. Others took jabs  at the pedigree of cricketing personalities who were at the opening; despite local squabbles  over the issue, there was some disappointment that former Indian cricket captain Sachin Tendulkar, for whom a stand was named at the stadium, failed to show up  at the opening as promised . Its [sic] a honor to watch Brian Lara west indies cricket batting legend and record title holder 400 not out batting in a cricket match in his own Brian Lara stadium which was official open [sic] today in Trinidad..
No amount of noise from the Opposition could keep their supporters away from seeing the Prince of [Port of Spain]. I doubt if there was any political persuasion not represented at the opening. 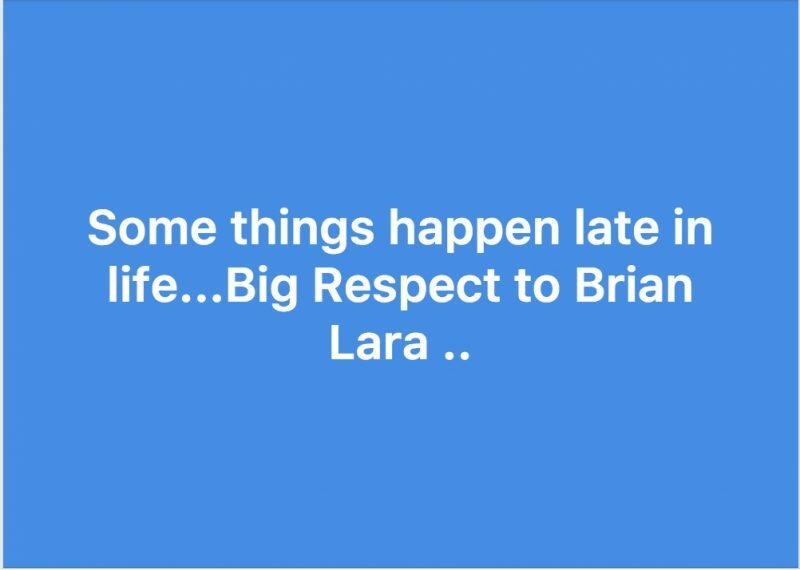 Friday was not about the PNM or the UNC; it was about Brian Lara and his people, the people of Trinidad and Tobago.